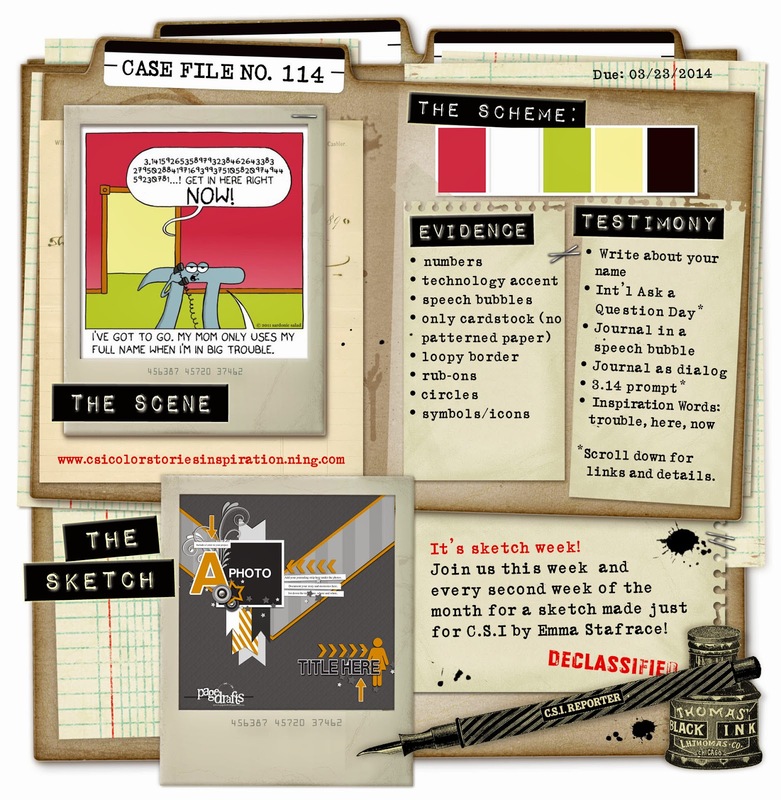 CSI mastermind Debbi Tehrani has found this intriguing Scene for us to explore - from this image, she takes five colours for the Scheme, as well as ideas for design elements, techniqes and journaling prompts. As it's the second week in the month, we also have one of Em's amazing sketches. At the time, I was working as a children's entertainer, doing puppet shows and parties, and often had to collect him from school still in my "uniform", but Tom didn't mind at all. A couple of times he dressed up as my little sidekick and came along to the children's ward at the local hospital where he was a big hit with the kids AND the nurses - a natural clown! So, did I follow all the clues ??? The Scheme - the colours are all there, plus there are some light blue and pink stripes in there, but you're allowed neutrals and up to 10% accent colour, so that's ok, and the paper was so perfect for the photo I just had to use it! Testimony - I journaled as a series of questions " WHO? Tom WHEN? 1989 WHY Clown Festival Parade WHERE? Truro, Cornwall WHAT? At six years old, Tom was a natural clown!" That red checked paper was so similar to the pattern of my clown trousers it was just perfect! The cork arrow is pointing to the T for Tom. The striped pp echoes Tom's blazer (which I used to wear myself when I was little) and the spots on the big clown-style flower pick up on his spotty tie. A button tied with twine adds a circular element, and the chevron symbols give more emphasis to the title. The wood veneer stars echo the subtitle and anyway I'm totally addicted to them - I just love how they add a bit of texture and fun to the page. So, that's how I solved this case - why don't you have a go? Pop over to CSI for loads more inspiration and ideas. Thanks for stopping by today, see you again soon. Looks good! 24 years later and I'm still clowning around, if somewhat less literally. Love it - that stripey PP is so perfect & you did a great job with the V in the sketch...I've got this out waiting for me....I really looove your Vibrant take. And the hand thing? TOTALLY CUTE!!! Thank you for your kind words ladies, I really appreciate it. Louise thanks for asking about the papers, I totally forgot to write down my ingredients and I've had both those papers so long I can't remember the details, but the stripes were an Abbey Road design and the checks were from Stampin' Up. The fab flowers are Papermania. I love everything about this layout and why am I not surprised to hear that you would dress as a clown. I love this fun layout that has Annie written all over it. I love that layouts make you think - like about the last time he held your hand... because one day you just realise that.... Stunning Annie layout.